From one extreme to another. Back on December 24th as the month long melt down accelerated, only 1% of all S&P 500 stocks were trading above their 50 day moving averages. This equaled one of the most extreme oversold readings ever. Fast forward to this week. 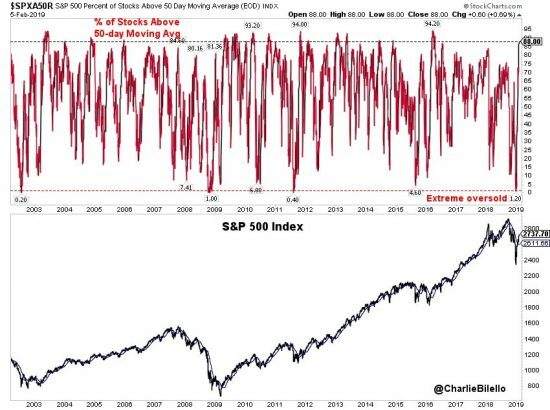 After a 16% rally off the Christmas week lows 88% of the S&P 500 are back above their 50 day moving averages, the highest reading since April 2016. This is also in the 96th percentile of historical data.